Ryan Childrey flips at Jumpology. If you saw the acrobats bouncing like rubber balls in last year's Cirque de Soleil performance in Richmond and thought, "Hey, I could do that," here's your chance. 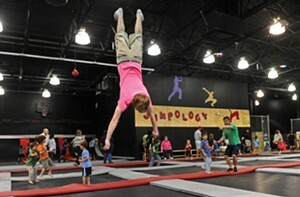 March saw the opening of Jumpology, a million-dollar, 20,000-square-foot, indoor trampoline gym on Brook Road near Virginia Center Commons. Trampolines cover floor and walls, and an enormous pit of foam blocks softens leapers' landings. Jumpology is equal parts sweat and play, offering workout classes, dodge-ball games, birthday parties and weekend JumpJam dance nights. An adult membership is $29 per month. jumpology.us.